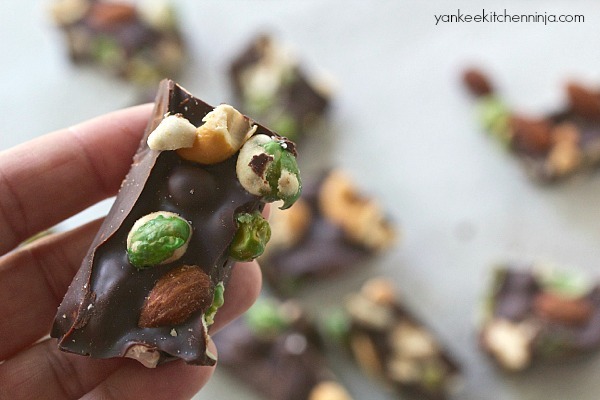 Part salty, part sweet and part spicy: wasabi pea chocolate bark with nuts is a totally addictive snack treat that's easy to make. I think you're going to be pretty darned happy that I'm taking a break from all my summer salad posts today. 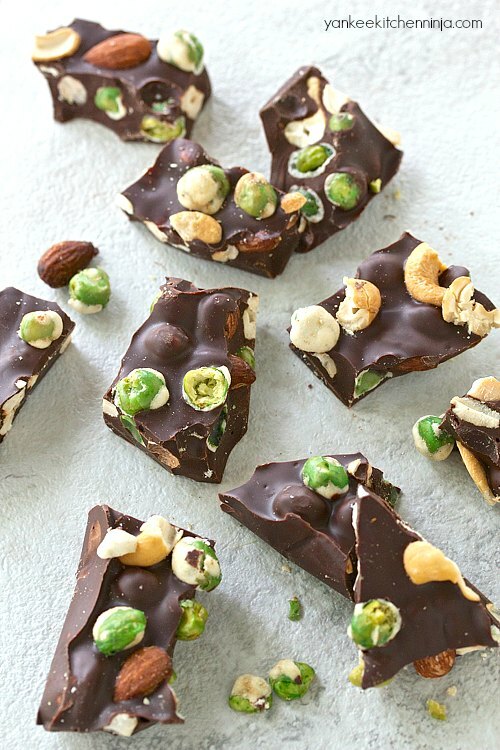 Put down your forks because today's feature is a tasty little snack that's part salty, part sweet and part spicy: wasabi pea and nut chocolate bark. I know, right? It's a crazy combo. I love those fiery little wasabi peas: totally addictive little snack crack. And it's like a game every time you put them in your mouth, because you never know which one is going to be extra fiery and shoot that quick flash of heat right up your nose and into your brain. BAM! 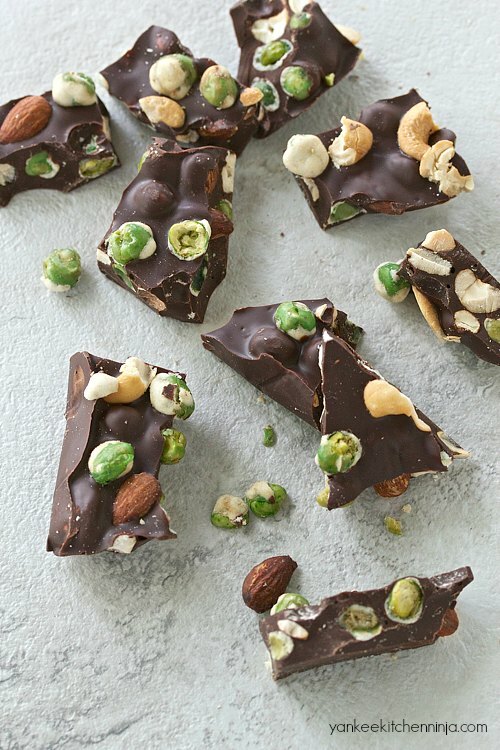 So it stands to reason that, as much as I looooooove combining salty and sweet tidbits together, wasabi peas would be the perfect addition to chocolate bark. And GUESS WHAT? They are! My local market supplies me with wasabi peas that are tossed together with almonds and cashews, but you can easily add whatever nuts you prefer (although who doesn't like almonds and cashews??!!). I just thank the market for the shortcut. And speaking of shortcuts, I love making chocolate bark because it is so freakin' easy peasy. I mean, it looks fancy and people are all "Ooooh, you made this?". But really, it's just melted chocolate that you stir some stuff into and chill. Anyone can do this! And can do it right about NOW. I make my bark in a 9-inch square baking pan because I like thick bark. Please note that you can use a larger pan and get thinner bark if you prefer it more daintily sized. Remember: it's just melting, stirring and chilling -- you can't mess this up. Holla if you're a fiery wasabi pea fan. Better yet, leave a comment: The Ninj wants to know. Bring about an inch of water to a simmer in the bottom of a double boiler (or set a heat-safe bowl snugly over a pot of simmering water). Place the broken chocolate in the top of the double boiler, stirring to melt. Once the chocolate is smooth, remove it from the heat, fold in the peas and nuts and pour the mixture into a parchment-lined 9-inch-square baking pan. Sprinkle the surface with additional peas and nuts. Cover (not tightly) with plastic wrap and pop into the refrigerator for about 5 hours or overnight. Lift out the contents of the pan and place it upside down on a large cutting board. Cut into as many pieces as you wish. And share. This makes a lotta bark. Jules - I LOVE THIS chocolate bark! The colors, and can just imagine how that salty sweet combo tastes. My mouth is watering! Hope you give it a try, Allie! 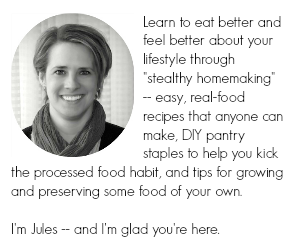 Let me know what you think, Kristin!